What exactly is required of full bucket seats for competition use? Holding features to maintain a steady driving position minimizing to-and-fro G, information features relaying the car’s behavior, and most important — safety features. Mugen has paid particular attention to these points in developing bucket seats over the years, and has established its own independent safety and design standards. In one circuit crash scenario, a forward impact occurs. In this case, the driver’s body is protected by the belt harness (seatbelt). Another scenario involves a collision from the rear. In this case, it is the seat that protects the driver. Mugen aimed to develop a seat that will not be broken even if it is accelerated 40G from the rear. The final specifications were eventually determined through numerous repeated destruction tests. The shell consists of a composite material of fiberglass and vinyl ester resin. The resulting structure has the necessary resistance to the stress distribution. Incidentally, the seat fitted as standard in the Type R is of German manufacture. The standard seat does rot, have a full bucket design, and is made to suit the comfort requirements and body proportions of various drivers. Ironically, at approximately 13.6 kg per leg (excluding seat rails), it is even heavier than conventional mass-production vehicle seats. The S1 Mugen full bucket seat has a weight of 5.8 kg per leg (excluding seat rails) while boasting high strength. Likewise, the tight shell configuration, patch section using the minimum necessary fabric, seat cushioning, and Ecsaine cover maintain high holding characteristics. 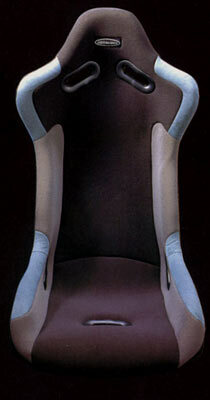 Also, the hip point (sitting position) is located approximately 70 mm lower than normal to give a direct driving feel. Specially designed seat rails (available separately) are used for mounting.